INHALATION of carbon oxide is now administered for various therapeutic and prophylactic purposes. The benefits afforded depend chiefly on the part which carbon dioxide plays in the control of respiration. 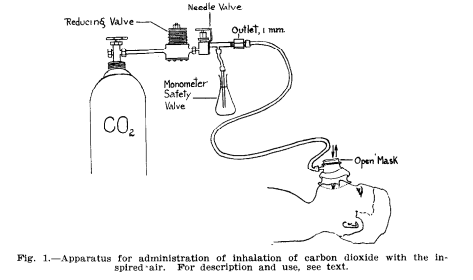 Resuscitation from asphyxia of the newborn,1 prevention of postoperative atelectasis and pneumonia,2 elimination of ethyl ether, of carbon monoxide,4 and of other anesthetic and toxic gases3 from the lungs and blood, all alike depend upon the increase of pulmonary ventilation under stimulation of the respiratory center by inhalation of carbon dioxide. The equally marked influence of carbon dioxide upon the circulation has not as yet, or to an equal degree, been exploited for therapeutic purposes. Yet, simultaneously with the modern development of respiration, physiology has produced also observations indicating a powerful influence of carbon dioxide upon the heart. In a long series of experiments,6 from fifteen to twenty-five years ago, my collaborators and I demonstrated on dogs, under artificial respiration or breathing naturally under a slight pressure of air after the opening of the thorax, a condition verging on tetanus of the heart-in the physiological sense of the word tetanus, that, is a fusion of successive beats. This state was effectively counteracted and heartbeats of full amplitude were restored as a consequence of the restoration of a normal,or perhaps slightly excessive, carbon dioxide content in the blood. The lesson of these observations is now generally applied in experiments upon the isolated heart in the Starling7 heart-lung preparation. It is recognized that the blood for perfusion, in addition to being oxygenated, must also be supplied with a sufficient amount of carbon dioxide to overcome the tendency of an exposed or excised heart to develop an inadequate diastolic relaxation. Otherwise it passes into a continuous systolic state, an incomplete tetanus or cramp of the heart. superficial similarity to the effects induced by inhalation of amylnitrite. But the effects, like those of a hot bath and in contrast to amylnitrite, are more physiological than pharmacological; they are lasting and are accompanied by a restoration of a full strong heart action and a recovery of normal arterial pressure. Never in my experience have there been any symptoms suggesting an overloading of the heart. Among the various treatments of heart disease, that at Nauheim is the most celebrated. It consists in baths in carbonated water. The good effects, which the treatment, is claimed to have, have never really been explained. There is a stimulating action upon the skin, but there is little ground for believing that a slight cutaneous hyperemia can by itself be of much benefit. It is at least possible that the greater part of the benefit sometimes derived from the Nauheim treatment is due rather to inhalation of the carbon dioxide volatilizing from the surface of the bath. With these considerations as a physiological background, it has seemed to me justifiable to try, with all due caution at first, the influence of carbon dioxide inhalation upon cases of angina pectoris which are as yet in their earlier stages, but in which moderately severe suffering on exertion is already developing. This is not an emergency treatment, but a therapy for prolonged application. The inhalations are not given during an attack of pain, but at regular times every day, usually before the midday and evening meals, and at bedtime. The patient lies uietly on his back for a few minutes holding over his own face a mask which has a sufficiently large opening to the outside air to offer no resistance to breathing. He is told to keep his mouth open and to breathe deeply rather than rapidly. Then a stream of carbon dioxide gas through a small rubber tube from a cylinder of the pure liquefied substance is fed to the mask. At first the flow is kept small, but as respiration gradually deepens the amount of the gas is increased until at the end of two or three minutes a maximal or nearly maximal depth of breathing is developed. The stimulation is not, however, pushed to the point of increase of rate. This condition is maintained for fifteen or twenty minutes continuously. Then the gas is shut off, and the patient is directed to lie quiet for ten minutes more, so as to avoid the slight giddiness which occurs if he gets up immediately. It is to be noted that the technic of this inhalation differs markedly from the use of a mixture of oxygen and 7 per cent carbon dioxide which is best employed for resuscitation from asphyxia. The inhalation used on these heart eases is on the contrary essentially like that applied by Henderson, Haggard and Coburn, and by White after anesthesia and operation.3 A mixture of oxygen and carbon dioxide is rather expensive, and a cylinder of it, is exhausted in a single inhalation; while on the contrary even a small cylinder of liquid carbon dioxide lasts for several weeks of this treatment.. so that its cost, aside from the control apparatus, is slight. But of course pure carbon dioxide should be used only with such an open mask that the small volume of the gas supplied is diluted by the patient’s breathing in the relatively large volume of the inspired air. The essentials of the control apparatus employed are (a) an open mask, as above described, and (b) a device for the control of the flow of the gas to the mask, so that by no possibility can the patient receive an excess ; it must be fool proof. For this purpose a water manometer only 100 to 120 mm. long is so arranged that it not only serves as a gauge but also as a safety valve, through which any excess supply of the gas blows off into the air without going to the mask. It is merely a straight glass tube, 5 mm. bore, which extends down for this distance below the surface of water in a bottle, flask or test tube. Between this manometer and the tube leading to the mask is a hole of not more than 1 mm. diameter. Thus the maximum volume of gas that can go to the mask is that which under a pressure of 100 to 120 mm. of water column will pass through a 1 mm. hole. The supply of gas to the manometer and to this millimeter hole is controlled either by a finely adjustable needle valve, or better by a McCaa reducing valve and a needle valve, as shown in Fig. 1. * If only the needle valve is used, it has to be frequently readjusted by the person administering the inhalation. If the reducing valve is used also, the flow is so steady that an intelligent patient may manage the entire procedure for himself. This is a distinct. advantage in a treatment which the patient may find it necessary to continue one or more times a day for the remainder of his life. For the utmost that can be expected, or even hoped, in regard to such a disorder as angina pectoris is not absolute cure, but, a check upon the fundamental conditions, prevention of suffering and prolongation of life. The effects of this inhalation on the patients thus far treated, as yet only three in number and none with high arterial pressure, have been, in addition to the deeper respiration, as follows: There is a distinct improvement in the color and temperature of the lips and skin, previously rather bloodless or bluish and cold, but becoming warm and pink under the influence of carbon dioxide upon the peripheral circulation. Arterial pressure and the pulse rate are not in appreciable degree increased, although a markedly fuller circulation is evident. The sensation of oppression in the chest, and the pain or “pins and needles” in the shoulder and arm is considerably decreased, and may cease altogether for some hours after the inhalation. After some weeks of daily inhalations the capacity to take such exercise as walking uphill is markedly increased, and the chief difficulty is to prevent the patient from overexerting his partially restored physical capacity. This is all that it seems justifiable to report in an initial communication on a treatment which will certainly need far more evidence before it can be regarded as of proved general therapeutic value. The cases thus far treated have, however, appeared so much benefited and the technic here described appears to be so safe, that it seems best to put the matter on record, in order that others also may try it for a class of patients for whom there is otherwise little that can be done to relieve or even to delay the development of a peculiarly painful, anxious and hopeless form of invalidism, with an ever-present risk of sudden death from coronary thrombosis. Mention may also be made here of the effects of this inhalation upon two cases of intermittent claudication in the lower extremities. In both of these cases a marked improvement in the circulation of the ischemic limb was observed under the inhalation. and in one in which the treatment was continued for some weeks there was a distinct cumulative beneficial effect. These cases were studied particularly in the belief that, if the pain in angina pectoris and that in intermittent claudication are due to similar local reactions, improvement in both types of cases would tend to support the probability that in both the results are real and not imaginary, either in the patient, or in the mind of him who has applied the treatment. Quite different, is the reaction in a person in whose heart or limbs the blood vessels are sclerotic or constantly contracted. The blood supply and therefore the oxygen supply are insufficient for the initial requirements of exertion. Lactic acid and other fatigue products accumulate; for in the absence of a large supply of oxygen they cannot be burned to carbon dioxide. They tend to induce a cramp of the musculature, cardiac or striated, in contrast to the influence of carbon dioxide which, as I long ago demonstrated experimentally on the heart, promotes relaxation.6 To do effective work a muscle must be able to relax as well as to contract. From excess of lactic acid and local deficiency of carbon dioxide come the abnormal reaction to exercise, the ischemia and the cramp. If now a patient who is liable to such an abnormal reaction receives an inhalation of carbon dioxide, still a third form of reaction develops. He experiences the benefits, without the disadvantages, of physical exercise. He makes no exertion. His muscles are at rest, and his heart is put, under no additional strain. There is no decrease of the oxygen supply to any part, but rather an increase, for the carbon dioxide inhaled induces a relaxation of the finer blood vessels, a more ample heartbeat, and a fuller circulation. The balance of supply and demand for oxygen in the tissues is thus distinctly improved and the tendency to cramp is diminished. Furthermore as the treatment is repeated day after day the blood vessels and the heart muscle, under the influence of an essentially normal physiological agent and an essentially normal reaction, gradually acquire and retain a state of decreased habitual strain and more normal behavior. Along these lines we may figure to ourselves why and how inhalations of carbon dioxide may exert a beneficial effect both immediate and to some degree lasting. In support of this general conception mention may here be made also of the extraordinary observations which were reported by the late Dr. A. S. Loevenhart10 in which he found that inhalation of carbon dioxide administered to cases of catatonia caused a temporary restoration of mental responsiveness. The simplest explanation of the results in these cases is to postulate an habitual contraction of blood vessels in the brain of the catatonic patient and to assume that the influence of carbon dioxide upon these vessels is similar to that upon the peripheral circulation elsewhere in the body. The effects of overbreathing in inducing, and of oxygen and carbon dioxide in temporarily inhibiting, fits in epilepties11 are also suggestive of a similar conception. Finally I have pleasure in acknowledging my indebtedness to my colleague, Dr. George Blumer, for the opportunity to work on one of the cases here reported, and to Dr. Samuel C. Harvey for two of the others. Investigations on the experimental side of this general problem are now being published from Dr. Harvey’s laboratory, and further investigations upon patients are to be conducted in the clinic here. Daily inhalations of carbon dioxide appear to offer a possibility of considerable amelioration of the crippling effects and suffering in cases of angina pectoris and also of intermittent claudication. *An apparatus of this type without the McCaa reducing valve may be obtained from the Foregger Company, 47 West 42nd Street, New York City. An apparatus with the reducing valve from the Mine Safety Appliances Company, Pittsburgh. Pa.
Henderson, Y.: The Prevention and Treatment of Asphyxia in the New Born, J. A. M. A. 90: 583, 1928. Incomplete Dilatation of the Lungs as a Factor in Neonatal Mortality, J. A. M. A. 96: 495, 1931. Henderson, Y.: Acapnia as a Factor in Postoperative Shock, Atelectasis and Pneumonia, J. A. M. A. 95: 572, 1930. Henderson, Y., Haggard, H. W., and Coburn, R. C.: The Therapeutic Use of Carbon Dioxide After Anesthesia and Operation, J. A. M. A. 74: 783, 1920. White, J. C.: Deetherization by Means of Carbon Dioxide Inhalations, Arch. Surg. 7: 347, 1923. Henderson, Y.: The Dangers of Carbon Monoxide Poisoning and Measures to Lessen These Dangers, J. A. M. A. 94: 179, 1930. Henderson, Y., and Haggard, H. W.: Respiration Influencing Their Action. Noxious Gases and the Principles of American Chemical Society Monograph Series, New York City, 1927, The Chemical Catalog Company. Henderson, Y.: Acapnia and Shock. I. Carbon Dioxide as a Factor in the Regulation of the Heart Rate, Am. J. Physiol. 21: 126, 1908. Starling, E. H.: Linacre Lecture on the Heart, London, 1918. Also Knowlton, and Starling, E. H.: The Influence of Variations in Temperature and Blood Pressure on the Performance of the Isolated Mammalian Heart, J. Physiol. 44: 206. 1912. Also Patterson, S. W., and Starling. E. H.: On the Mechanical Factors Which Determine the Ouput of the Ventricles, J. Physiol. 48: 357, 1914; with Piper, H. : The Regulation of the Heartbeat, J. Physiol. 48: 465, 1914. Henderson, Y., and Harvey, S. C.: VIII. The Venopressor Mechanism, Am. J. Physiol. 46: 363, 1918. Bryant, J., and Henderson, Y. : Closed Ether and a Color Sign, J. A. M. A. 65: 1, 1915. Miescher, F.: Bemerkungen zur Lehrc van den Athembewegungen, Archiv. f. Anat. u. Physiol. 1885. Physiol. Abtheilung, p. 355. Republished in Die Histochemischen u. physiologischen. Arbeiten von Friedrich Miescher. Verlag C. W. Vogel, Leipzig, 1897. Loevenhart, A. S., Lorenz, W. F., and Walter, R. M.: Cerebral Stimulation, A. M. A. 92: 880, 1929. Lennox, W. G., and Cobb, S.: Epilepsy, Medicine 7: 162, 1928.